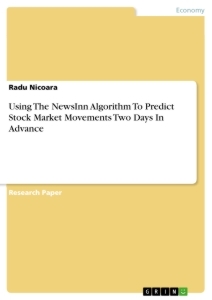 Since the stock market is heavily affected by world problems, and therefore, world news, it is highly likely that a general sentiment analysis of the news would produce a result directly related to the general sentiment of the public on the world affairs. This would theoretically, in time, affect the stock market. The time-to market of world news we estimated to be of a few days, since only huge global events have the power to change the stock price in-day. Therefore we started testing at a one-day offset, then went on for two, three, and even four days offset between the news data and the stock data. We only kept the data that provided the highest accuracy in predicting the stock market indexes flow. Were data could not be found, we duplicated the last known data. That is, the last row of the table. But this row was not taken into account when doing the calculations. Please see below in blue (on the right). The prediction, two days in advance , for the Dow Jones Index had the highest degree of accuracy, with an average prediction rate of 69.44%. For 4 of the days, for unknown reasons, the prediction was offset by a day, so it could only predict the moving of the index in a one day interval. This was probably due to the refugee crisis. For the offsetted case we divided the number of days correctly predicted by a factor of two.